So August was beyond crazy around my house. Lots of good crazy, but crazy none-the-less. And I'll admit, I'm tired. That's why things around here have been a little quiet lately. See, in the middle of all the busyness of August I let something slip--my personal time with God. If I'm honest, it had been growing smaller and smaller all summer until it somehow became non-existent. Something I didn't even realize until I became bone-weary exhausted in my very spirit. If I'm being even more honest, a huge reason behind that slip was struggling with how God sees me. Oh, I am assured he loves me, and I'm crazy in love with him. But when another rejection came in early summer for a project I had worked on, it began to feel like a rejection from God. Like what I thought was my purpose, well, wasn't. And I started to grow weary. Weary in my calling to writing and my heart for ministry. A version of Galatians 6:9 says, "Do not lose heart..." and that's what was happening to me. I began to flounder. But God is so good to us, isn't he? Always calling us to him. Ever faithful and never wandering. It's us who wander:) So this month of September, while school begins again and everything pumpkin spice pops up in stores, I'll be spending it burrowing back into my time with God. 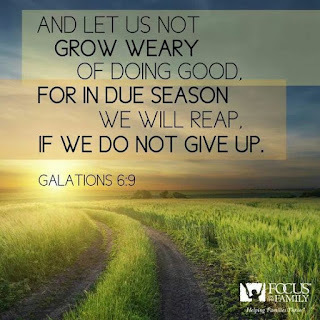 Things will be quiet around here as I work on the last part of that verse: do not give up. It's time to take a break, soak up some Living Water, and pray about direction and next steps. Have a wonderful beginning of Fall, friends! Oh, Susan, I get it. I do. We begin to think what we do is who we are. We forget Whose we are ... and that we don't have to do anything to be of value. But then there's the balancing act of holding our hopes and dreams close to our heart without letting our disappointments along the way cause us to grow weary and worn out. (You said it all so well in your blog post.) 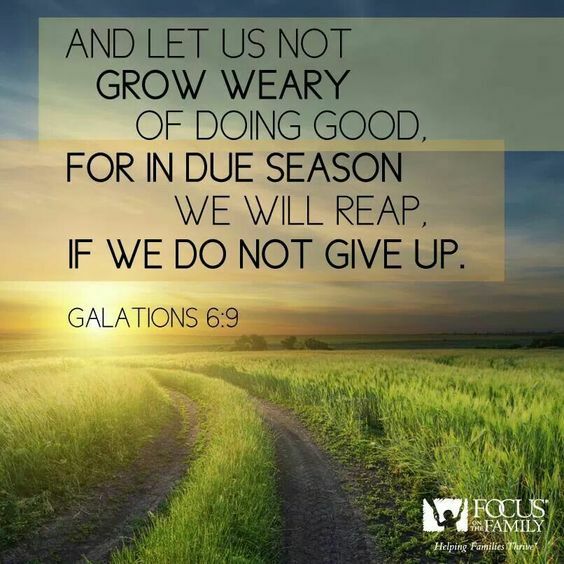 We can't ever really give up because we are made in God's image and being creative -- being writers -- is who we are. It's how we reflect God to the world. You do that here ... and in the stories you write. Praying for you not to lose heart ... and not to lose sight of Whose you are.